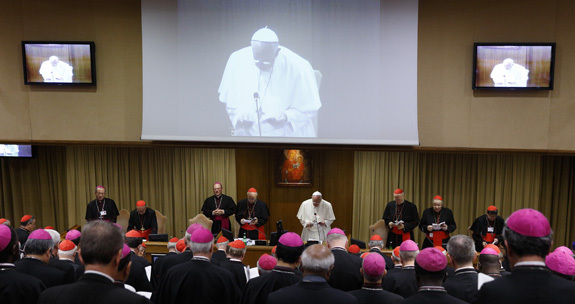 “We, Synod Fathers, gathered in Rome together with Pope Francis in the Extraordinary General Assembly of the Synod of Bishops, greet all families of the different continents and in particular all who follow Christ, the Way, the Truth, and the Life. We admire and are grateful for the daily witness which you offer us and the world with your fidelity, faith, hope, and love. We offer you the words of Christ: “Behold, I stand at the door and knock. If anyone hears my voice and opens the door, I will enter his house and dine with him, and he with me”. On his journeys along the roads of the Holy Land, Jesus would enter village houses. He continues to pass even today along the streets of our cities. In your homes there are light and shadow. Challenges often present themselves and at times even great trials. The darkness can grow deep to the point of becoming a dense shadow when evil and sin work into the heart of the family. There is also the evening light behind the windowpanes in the houses of the cities, in modest residences of suburbs and villages, and even in mere shacks, which shines out brightly, warming bodies and souls. This light—the light of a wedding story—shines from the encounter between spouses: it is a gift, a grace expressed, as the Book of Genesis says, when the two are “face to face” as equal and mutual helpers. The love of man and woman teaches us that each needs the other in order to be truly self. Each remains different from the other that opens self and is revealed in the reciprocal gift. It is this that the bride of the Song of Songs sings in her canticle: “My beloved is mine and I am his… I am my beloved’s and my beloved is mine”. This authentic encounter begins with courtship, a time of waiting and preparation. It is realized in the sacrament where God sets his seal, his presence, and grace. This path also includes sexual relationship, tenderness, intimacy, and beauty capable of lasting longer than the vigour and freshness of youth. Such love, of its nature, strives to be forever to the point of laying down one’s life for the beloved. In this light conjugal love, which is unique and indissoluble, endures despite many difficulties. It is one of the most beautiful of all miracles and the most common. The high point which sums up all the threads of communion with God and neighbor is the Sunday Eucharist when the family and the whole Church sits at table with the Lord. He gives himself to all of us, pilgrims through history towards the goal of the final encounter when “Christ is all and in all”. In the first stage of our Synod itinerary, therefore, we have reflected on how to accompany those who have been divorced and remarried and on their participation in the sacraments. Father, grant that we may all see flourish a Church that is ever more faithful and credible, a just and humane city, a world that loves truth, justice and mercy”.